The District Chief Executive (DCE) for Asene Manso Akroso (AMA), Mr. Alex Incoom together with the District Planning Officer Mr. Ben Quacoo and the Works Sub-Committee Chairman Mr. Emmanuel Yeboah Mireku with other officials of the Assembly embarked on site inspection of some Key District Assemblies Common Fund (DACF) projects at Akyem Manso. It will be recalled that, in December last year Mr. Incoom performed a sod-cutting and commission of series of projects at different locations in the District which were scheduled to be completed within 12-months. The inspected projects include a 6-units classroom block with an ancillary facilities for Akyem Manso R/C Primary and JHS, a 10-seater ultra-modern toilet facility to improve sanitation and a borehole with overhead tank to supply clean and hygienic water in the area. 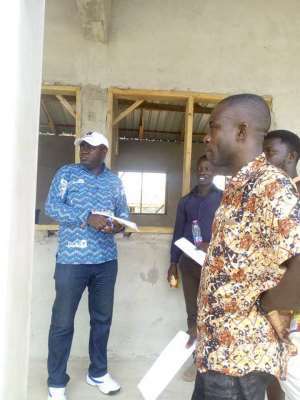 Speaking to the people at the inspection site of the 6-units classroom block, the workaholic DCE stated that the projects would enhance access to education and improve standard of living for the people. Mr. Incoom expressed satisfaction at the pace of work after the inspection and noted that the projects form part of the government's commitment to improve education in the area. According to him the inspection also forms part of the post contract award monitoring and evaluation process to ensure that contractors conform to the project specification and use of quality materials for construction works. The District Works Engineer, Mr. Bernard Osabu said that “indeed there is real value for money. The materials being used by the contractors were of standard quality and will help the project to last longer when completed. He also commended the DCE for always championing value for money agenda in all projects”. On his part, the Site Engineer, Mr. Patrick Kwaning expressed appreciation to the District Assembly and management for the support given them but appealed for prompt payment of Interim Payment Certificates to ensure early completion of the project. Mr. Incoom in an exclusive interview noted that, the one year old District is receiving massive improvement, especially in the area of education and health. According to him government is committed in making sure that the needs of the people are met at all levels of life. He used the opportunity to thank all staff for the support given him since he took over as DCE for the area and advised them to take the District as their own and work hard for the progress of the Assembly.